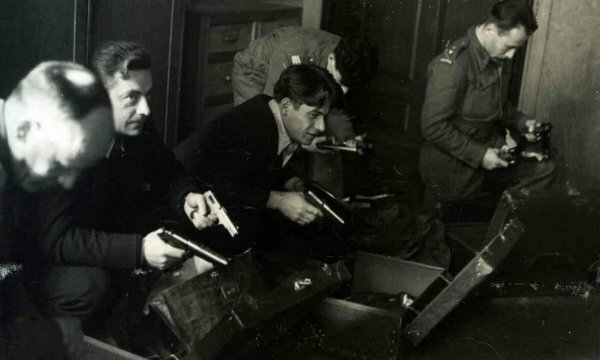 Senior officers and veterans from Polish and British special forces are to gather in London to mark the 75th anniversary of a little-known chapter of the secret war against the Nazis. The soldiers will on Saturday be honouring the Cichociemni (the Silent and Unseen) – Polish guerrilla fighters trained in Britain. They were parachuted at night into occupied Poland from 1941 onwards, the first such air drops behind German lines, to lead the resistance movement against the Nazi occupation. c1943, one of the Cichociemni. 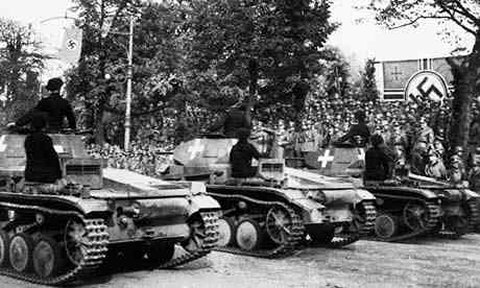 Of the 316 Cichociemni who parachuted into occupied Poland, 103 were killed in the war, either in combat or in camps or under Gestapo torture. Nine were killed by the Soviet secret police after the war, and many more were imprisoned. Some managed to avoid capture by melting back into postwar Polish life, either changing their names or keeping their wartime exploits a secret. Just one of the 316 is still alive. Aleksander Tarnawski, who flew to London for this weekend’s event, is 95 but evidently still fit. Less than two years ago, he carried out a parachute jump. 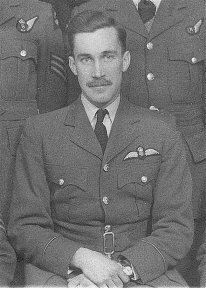 Up until then, Tarnawski had last launched himself out of a plane in April 1944, when he jumped at night from an RAF Halifax bomber flying from Brindisi, southern Italy. He landed in a village outside Warsaw near the banks of the Vistula, where he was met by partisans who knew him by his codename, Uplaz (a southern Polish dialect word for meadow). After a period of reconnaissance, he took command of an AK group in Nowogródek (now Navahrudak in Belarus). 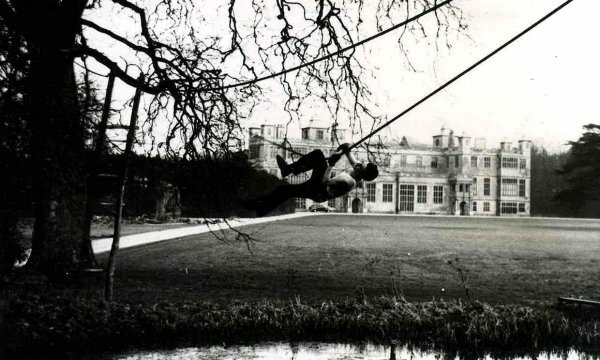 Grom’s first commander, Slawomir Petelicki, tracked down former Cichociemni parachutists in 1995 to ask permission to use the name in the unit’s title, and took one veteran to Hereford to watch his men train with the SAS as a way of convincing them Grom were worthy successors. Since then, Grom’s full title includes the words “named in honour of the Cichociemni of the Armia Krajowa”. Tarnawski, who was studying chemistry in Lódz at the time the war broke out, walked out of the country over the southern mountains to Czechoslovakia and Hungary to join free Polish forces in France. And when France fell he crossed the Pyrenees and got on a boat to the UK. The Station 43 course involved close combat, robbery, planting booby traps, assassination and forgery, as well as mock raids on the post office and other local institutions, which sometimes led to misunderstandings, occasional injuries and at least a couple of deaths from friendly fire. Despite all that, relations with locals stayed cordial to the end of the war. “At every stage of the training, starting with the Scots, all the people we worked with and trained alongside were good, decent and honest people. I look back at it with enormous pleasure,” Tarnawski recalled. 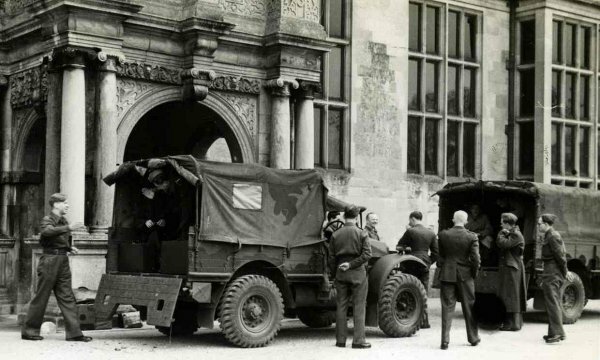 Audley End was run by the Polish section of the SOE, and they guarded their autonomy closely. 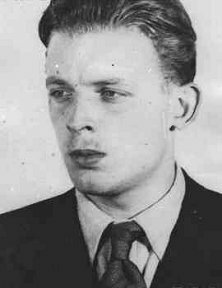 Unlike other national sections, the Cichociemni ceased to be SOE soldiers as soon as they touched down on Polish soil, and came under AK command. They were involved in some of the great intelligence coups of the war. At one point they were able to recover a German V2 rocket and smuggled its components into Poland, from where it was flown in a RAF Dakota plane back to the UK for study. soldiers in uniform gather around two army vehicles. flying underground fighters, spies and materiel from Italy to Poland. From Elrose, Saskatchewan. Killed in Action Jun. 24/44 age 26. #148 Squadron (Trusty). BROTHER to James Gordon Hillman. Halifax aircraft # JP237 missing during a secret night operation twenty three miles north-east of Genoa. Flight Lieutenant Pilot Hillman is buried in the Staglieno Cemetery, Genoa, Italy. 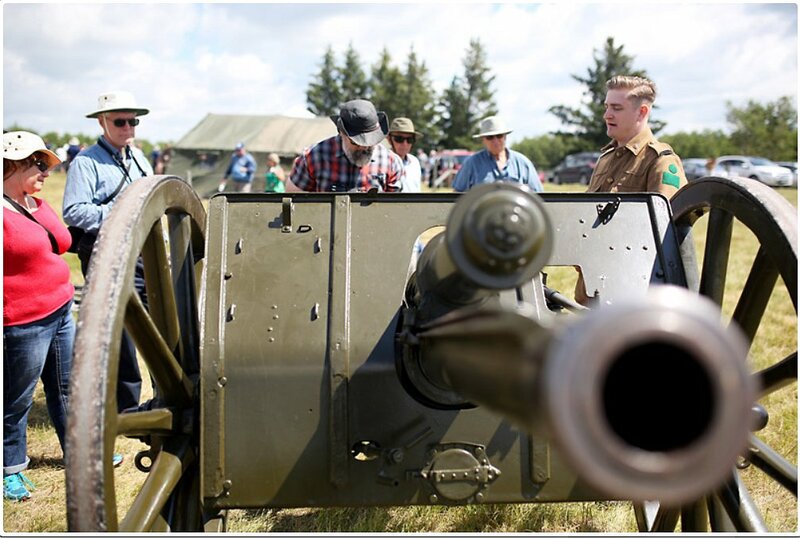 tells visitors to Camp Hughes about the 18-pounder field gun on display. 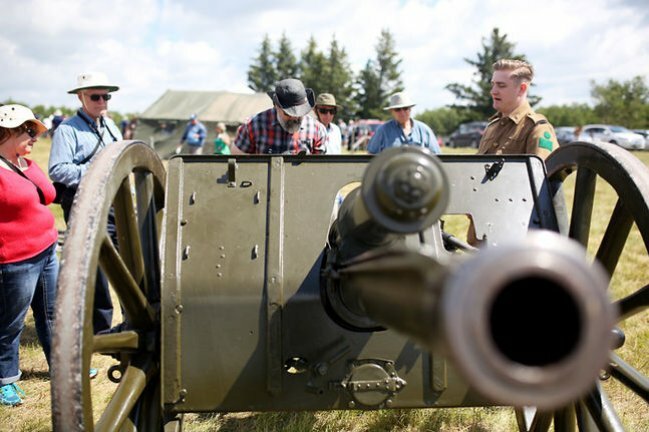 CAMP HUGHES — A crowd of roughly 300 were present at Camp Hughes on Sunday for a ceremony that recognized the former training grounds as a national historic site. The 60-acre national heritage site hosts a 10-kilometre system of trenches that were used to train soldiers in the First World War. 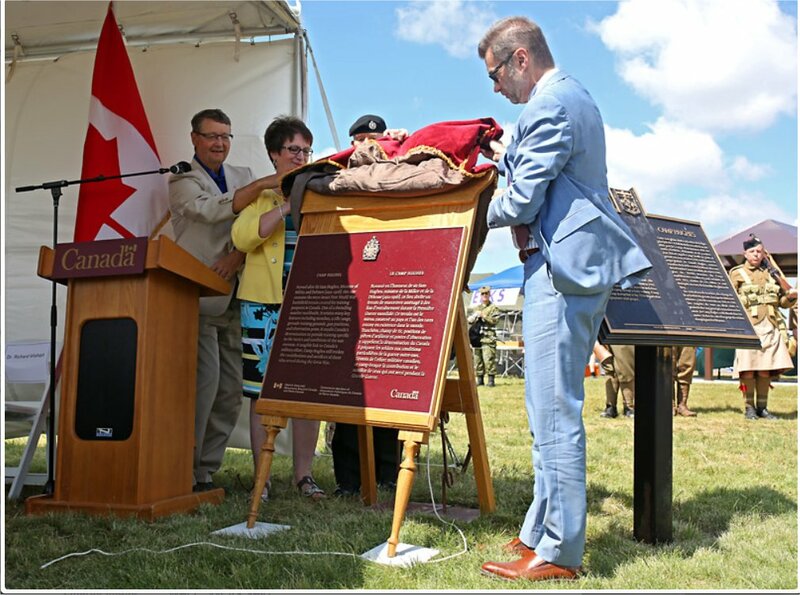 While the site had received its provincial designation as a site of significance in 1993, it took until 2012 to receive confirmation of its national designation. "It’s been a long time coming, and we’re very happy," said Brad Wells, vice-chair of Friends of Camp Hughes. "And we’re just so happy with the turnout today, ‘cause you never know. But everybody you talk to here has been affected somehow by these trenches." 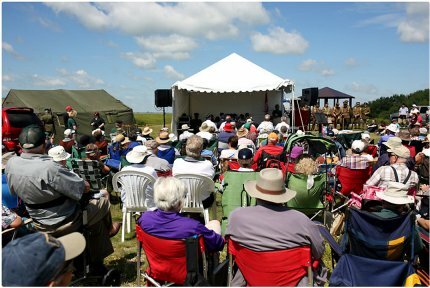 Friends of Camp Hughes — a committee consisting of representatives from the RM of North Cypress-Langford, Town of Carberry, Parks Canada, Military Historical Society, Shilo’s Royal Canadian Artillery Museum and their volunteers — decided to postpone the presentation ceremony until 2016, which is considered the centennial of Camp Hughes’ busiest year. 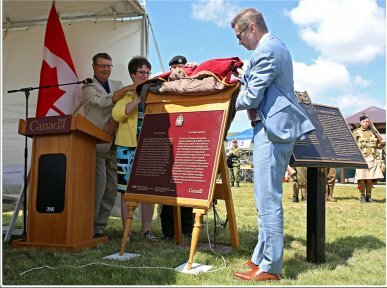 In 1916, Camp Hughes had been home to nearly 40,000 soldiers and staff, making it the second-largest settlement in Manitoba at the time. "The trenches are basically a ditch in the ground, but the stories that go with this place is the amazing part of it, because you think of the 27,000 men that went and not everybody came home. How many doctors and lawyers and politicians and farmers did we lose, out of those men? What would Manitoba have been like if those guys had lived, or there’d never been a war?" Wells said. "This place is more than just trenches; this place is about stories." 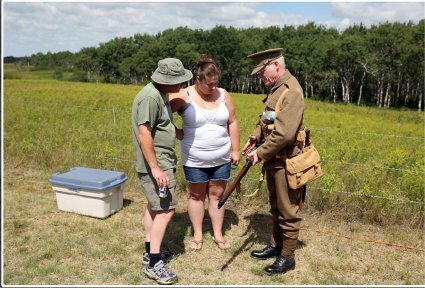 Those who gathered at the national historic site Sunday afternoon came for the stories, as well. As a girl, Lillian Glenn understood that the shell hole in her father’s arm and the barbwire scar down his back were tokens of his service, but didn’t express much curiosity beyond that. Yesterday, however, she visited Camp Hughes to satiate that interest. "My father trained here in the First World War with his brother before they went overseas, so I wanted to see the grounds where he trained," Glenn explained. Her father, Ernest Kenward, and his brother John had enlisted at Birtle in 1915, and fought in Europe as privates. Glenn’s father came back; her uncle did not. "(He said) he and his brother went over the top of the trench together, and they started running, and then the next time he was able to look to his left for John, John was not there. He’d been shot — or killed. And there was no way you can go back and try to find somebody. They were ordered not to stop so they had to continue running," recalled Glenn of her father’s stories. "I’m glad I came. I feel very glad to see that those sacrifices men made are being honoured in this way, they’re not being forgotten. And I think that’s really important. Don’t forget." during a ceremony at Camp Hughes west of Carberry on Sunday. his daughter Aletha Riegel at Camp Hughes on Sunday.